You should download CellicaDatabaseWiFi.exe file if you have not done it already. Please make sure that your computer is connected to the Internet. Software has online registration process so it needs interent for installation and registration. Double Click on this Setup file, this will show following screen. Now Personal Edition is default option available. This is for individual user, who wants to synchronize data with single mobile device. Corporate edition is available for users who want's to synchronize data for more than one mobile device. After selection of Personal Edition, Enter 40 character UDID of your iPhone. To get UDID, connect your iPhone to your Windows base PC and launch iTunes. In iTunes, select your device in the Devices section and navigate to the Summary tab. Click on the Serial Number label to reveal the Identifier field and the 40 characters UDID. Press Ctrl+C to copy the UDID to your clipboard, and paste it in UDID and Confirm UDID field. 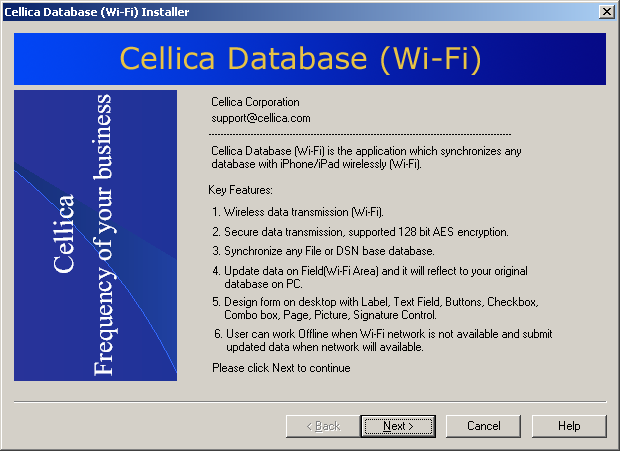 After successful installation of the software on PC, installation location path will have Cellica Database (Wi-Fi) folder contains Desktop Files folder. Desktop Files contains CellicaDatabase.exe and other files required for this software. Shortcut for CellicaDBWFAdmin.exe and User Guide is available on your desktop. 1. Search "Cellica Database for iPhone WiFi"in iTunes and download the app. 2. Once the download is complete, sync your iPhone with iTunes. 3. Go to the Home Screen on your device and tap the 'CellicaDB-WiFi' icon. 2. 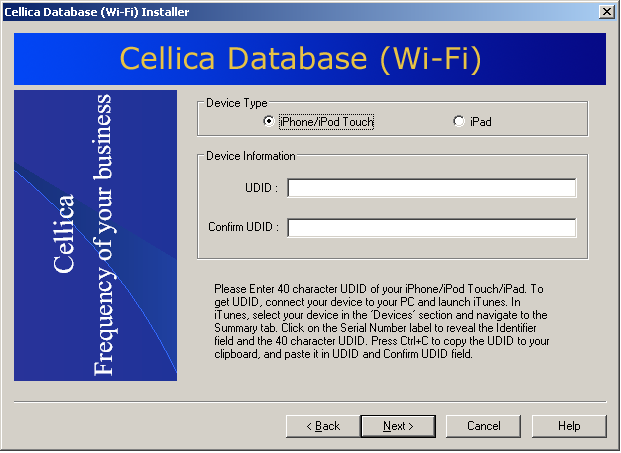 Search for "Cellica Database for iPhone WiFi".